CSIH is very pleased with this year’s WHD Canada media coverage as it has reached millions of Canadians in both official languages. This included extensive print and online coverage with 40 national and local news outlets covering WHD events that took place across Canada. The full list of WHD Canada media coverage can be found here. Additionally, WHD events received TV and radio attention from national and local news outlets. Furthermore, World Hepatitis Day hashtags (#WHDCanada2017 #WHD2017 #NOhep #LightsUp4Hep #ShowYourFace) were used by partnering organizations across Canada on multiple social media platforms. Please see below for the full list of WHD Canada 2017 media coverage. If we have missed any print, radio or TV media coverage and you would like to add it to the list, please email Ecaterina Damian edamian@csih.org. We are thrilled that the WHD 2017 message has reached millions, as only together can we make the elimination of viral hepatitis our next greatest achievement! Due to your hard work and collaborative efforts, this year’s WHD Canada media coverage has reached millions of Canadians in both official languages. To view the updated media coverage highlighting the national efforts during the WHD Canada 2016, please see below. If we have missed any print, radio or TV media coverage and you would like to add it to the list, please email to Ecaterina Damian edamian@csih.org. In addition to the extensive print, TV and radio coverage, WHD Canada 2016 was trending on social media as well. Please visit the Storify for the National WHD Canada events here: https://storify.com/CSIHHepC/world-hepatitis-day-in-canada-2016 and for the WHD Ottawa event here: : https://storify.com/CSIHHepC/world-hepatitis-day-ottawa-2016. We are very happy WHD 2016 message has reached millions, as only together we can make the elimination of viral hepatitis our next greatest achievement! Vancouver Sun: Opinion: Can we eliminate hepatitis? 98.5 fm: Vous en êtes peut-être atteint sans le savoir, connaissez-vous l’hépatite C? CTV Kitchener: Cure for hepatitis C? This year, the Canadian Society for International Health (CSIH) developed an audio news release in French and in English to support the World Hepatitis Day (WHD) 2016 campaign in Canada. The audio new release was broadcast on radio stations across Canada and reached an estimated 1.8 million Canadians. For details on the media outreach, please see the report here. To listen to the English audio news release please visit our YouTube channel here, to listen to the French audio news release, please visit our YouTube channel here. As part of our National World Hepatitis Day 2016 Campaign, landmarks across Canada were lit up in light green, the colour of the NOhep movement. This year the following landmarks were lit up: The CN Tower, The Canadian and American sides of Niagara Falls, Skylon Tower in Niagara Falls, the town arches of Pelham, Toronto City Hall and the Toronto Nathan Phillips Square sign . Did you get a picture? Send them to us here or by tweeting using the hashtag #LightsUp4Hep and tweeting @CSIH_ on twitter! To launch the World Hepatitis Day (WHD) campaign in Canada this year, the Canadian Society for International Health (CSIH) co-hosted the first Parliamentary Breakfast with the Honourable Jane Philpott, Canada’s minister of health. The event brought together government officials, decision makers, public health professionals, community based organizations, and the general public in their collective effort to eliminate hepatitis. CSIH is happy to announce that the media coverage for the Parliamentary Breakfast was very successful as the media outreach was approximately 3.4 million Canadians. Please see below for articles on the Parliamentary Breakfast in the news. World Hepatitis Alliance (WHA) works with governments, members and other key partners to support and elevate the voices of people living with viral hepatitis, to raise the profile of viral hepatitis and to help establish comprehensive hepatitis strategies which have robust prevention measures and access to affordable diagnostics and treatment. WHA has launched the World Hepatitis Day (WHD) 2016 website and materials and announced the re-branded theme under which governments, health care providers and communities will consolidate their efforts to eliminate viral hepatitis as a public health concern. WHA also announced that they will be officially launching a movement called NOhep, on WHD July 28 of this year. NOhep, standing for no hepatitis, is a global movement to eliminate viral hepatitis by 2030. The Canadian Society for International Health (CSIH) actively supports the NOhep efforts and encourages everyone to sign up to the movement at www.NOhep.org, to add WHD activities to the WHA map of impact here http://www.worldhepatitisday.org/en/events , to use the NOhep logo for your communications and to use #NOhep and #WorldHepDay in addition to the Canadian hashtags, #NOhep, #WHDCanada2016, #LightUp4Hep and the Canadian logo. A new color, green, was chosen for the logo as it is vibrant and represents positivity. The logo consists of three circles of different shades of green. The movement of colors on the circles, from dark green to lighter green, represents the future and the bright way towards the goal of eliminating hepatitis as a public health concern by 2030. For more information please see WHA’s webinar on the WHD 2016 campaign and materials https://www.youtube.com/watch?v=4eRGBOUs1Uo. The 2015 Correctional Services of Canada Art Contest for the World Hepatitis Day campaign are in! After much deliberation, CSIH is pleased to announce the winning posters for the 2015 Correctional Services of Canada Art Contest for the World Hepatitis Day campaign. It was a tough decision, but our judges were able to narrow it down to a male and female winner. The winning posters can be found on the Art contest page. 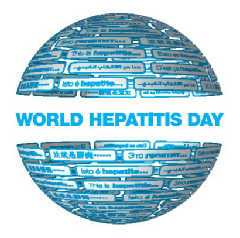 We want a world without viral hepatitis! The World Hepatitis Alliance (WHA) produced a collaborative video where organizations across the world marking World Hepatitis Day (WHD) were invited to submit videos. Please feel free to share the video We want a world without viral hepatitis where Canada’s voice is represented! WHD 2015 #LightsUp4Hep lit up a landmark near you! As part of our National World Hepatitis Day 2015 Campaign, landmarks across Canada were lit up in Amber and Red, the colours of the hepatitis awareness ribbon. This year the following landmarks were lit up: The CN Tower, The Canadian and American sides of Niagara Falls, Skylon Tower in Niagara Falls, The Heritage Building Ottawa, Halifax City Hall, BC Place Stadium and Science World Vancouver. Did you get a picture? Send them to us here or by tweeting using the hashtag #LightsUp4Hep and tweeting @CSIH_ on twitter! Hepatitis C has no symptoms until a dangerous amount of liver damage has occurred. Are you at risk?